The 76ers/Nationals franchise has had a wealth of superstar, supremely talented players. Wilt Chamberlain, Moses Malone, Julius Erving, Dolph Schayes, Allen Iverson, Billy Cunningham, Charles Barkley, and on and on and on. Well, none of those players is the franchise’s all-time leader in games played and points scored. That would be Harold “Hal” Greer, the greatest middle distance jump shooter of his generation. Hal Greer launching his vaunted mid-range jumper. The modest, 6’2” guard never led the NBA in scoring. In fact, he never came close during any one season. But he did average between 18 and 24 PPG every season from 1961 to 1971. Greer also played 1003 of a possible 1037 games in stretch. Put those facts together and what we have is the NBA’s 5th all-time leading scorer and the NBA’s all-time leader in games played when he retired in 1973. Hal also never came close to sniffing an assist title, but he was a crafty passer. He set picks off the ball that peeled defenders away from their assignment. He slyly dashed to the open spots in the half court to pull of his mid-range jumper. His handle allowed him to penetrate all the way to the basket or stop-and-pop on a dime. He gamely played through what seemed like a perpetually bad hamstring. Seriously, look at any photo of Mr. Greer from his career and he’s likely to have his thigh wrapped up tight. Even with a knee brace and thigh wrap, Hal Greer still directing offense later in the early 1970s. Hal never made the All-NBA 1st Team thanks to the omnipotent Jerry West and Oscar Robertson, but he did tally seven consecutive All-NBA 2nd Team appearances and ten straight All-Star games. By these measures and more, you’re talking about one of the greatest players in the history of basketball. Somehow, though, Greer manages to skim along just below the popular memory’s surface, even though he had one of the silkiest jump shots to ever grace the hardwood. 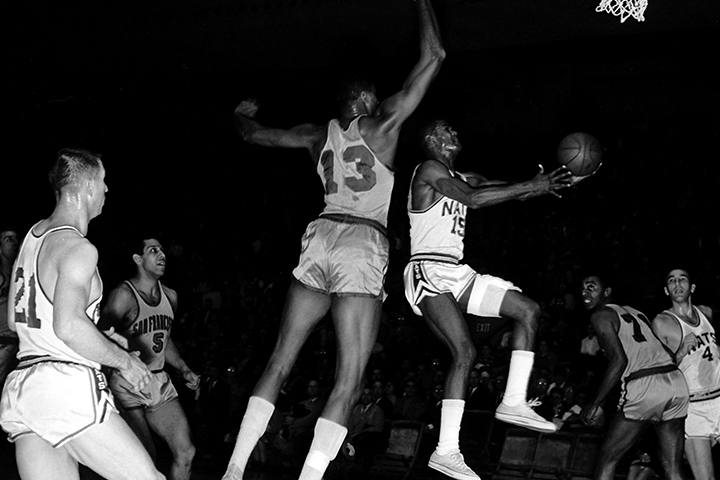 Greer’s NBA career began in 1959 with the Syracuse Nationals, the smallest of the NBA’s markets at the time. Perennial All-Star Dolph Schayes commanded what little attention Syracuse received from national sports media. Schayes was also still in command as the Nationals best player. However, the quiet guard from West Virginia, broke out in 1961 and replaced Schayes as the club’s best player. The Nationals were never a one-man band though. Greer and Schayes could depend on such stellar players like Larry Costello, Johnny “Red” Kerr, Dave Gambee, Al Bianchi, and Chet Walker. When the franchise moved to Philadelphia for the 1963-64 season, Greer was in fine form averaging 23 points, six rebounds, and five assists per game. The newly-christened 76ers, though, fell to just 34 wins following a 48-win campaign in their final season in Syracuse. 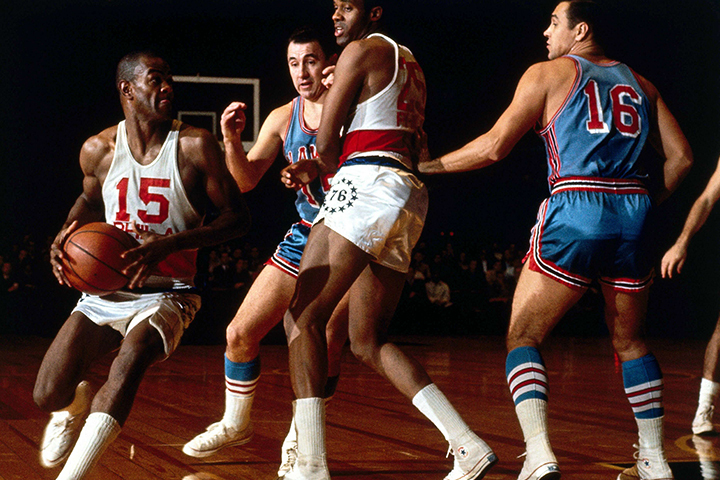 While with the Nationals, Hal Greer driving on future teammate Wilt Chamberlain of the San Francisco Warriors. The addition of Wilt Chamberlain re-energized the club and propelled them to the 1965 East Finals, but also led to an adjustment for Greer. When the February 1965 trade for Chamberlain went down, Greer had been the dominant offensive player for Syracuse for nearly half-a-decade. As good a scorer as Greer was, a talent like Chamberlain’s necessitated a new order. However, adjustments don’t have to be negative. Indeed, Greer’s skills as an off-ball screener and pick-and-pop shooter were perfect for Chamberlain’s little-heralded passing skills, particularly after Alex Hannum arrived to coach the team for the 1966-67 season. As the 76ers tore through the regular season with 68 wins, Greer saved his best for the postseason. In the playoffs versus Cincinnati, Boston, and San Francisco, Hal unleashed 28 points a night. 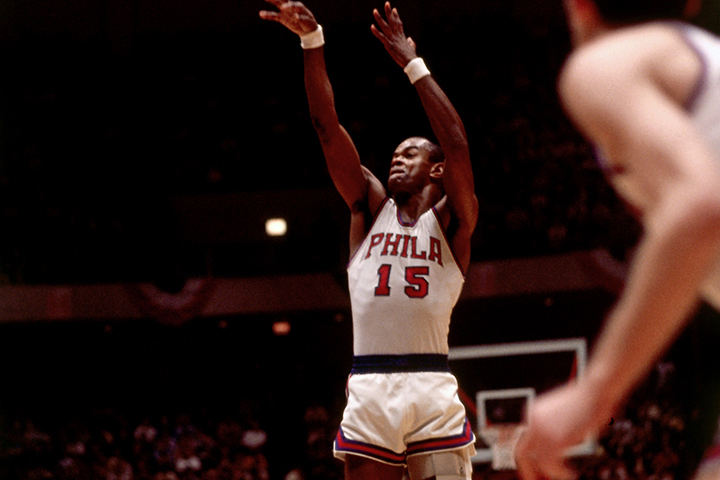 The average made him the team’s leading scorer as they secured the first franchise title in Philadelphia. Greer coming off a screen set by Chet Walker as St. Louis Hawks players Richie Guerin and Cliff Hagan (#16) defend. All four players are in the Hall of Fame. Greer would go on to play six more seasons with the franchise. His final season, 1972-73, was the infamous year Philly went 9-73. Honestly, though, it was fitting Greer was around to experience that. The venerable guard had seen so much of the franchise over the course of his 15-year career. No one else in franchise history had been through such changes as what Greer saw. He was with the team through some of its best days in Syracuse. Saw it transplant to Philadelphia. Played for and with an unbelievable amount of franchise legends. He saw the team at its highest height and its lowest low. All the while, Greer offered up a steadiness and professionalism that bridged any number of transitions in his long career. Honestly, it’s perfect that his go-to move was the mid-range jumper. It wasn’t always flashy. It certainly didn’t draw your attention at first glance like a Dipper dunk or an Iverson crossover. 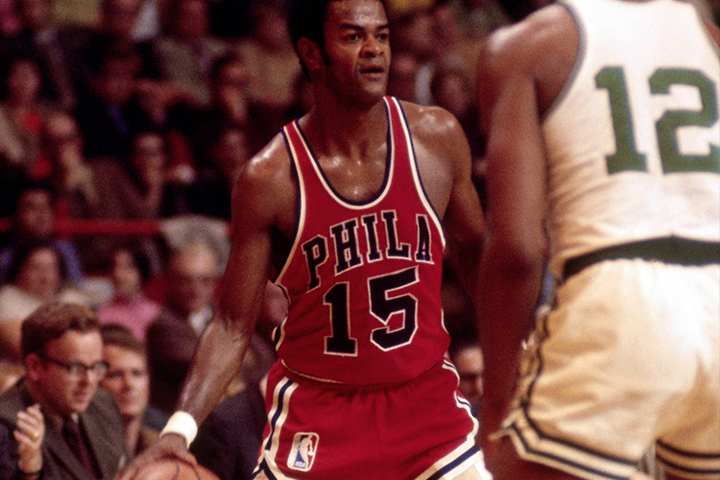 But once you notice – once you actually sit down and patiently soak in the work ethic – you can’t help but marvel at the persistent and inexorable career of Hal Greer.